The Important Features Of This Configuration Are Efficient, Effective Bond Of Fin To Tube Under All Conditions Of Temperature And Pressure, And Ability To Withstand High Fin Side Temperatures. This Solid Fin Configuration Is The Most Rugged And Will Stand Up To Repeated Cleanings For Fin Fouling If That Is A Problem In The Application. Tube outer diameter: 3/8" to 3/4" and 1" to 4"
Tubes -: Carbon Steel, Alloy Steel, Stainless Steel, Copper, Cupro Nickel & Aluminium Brass. Fin -: Copper, Carbon Steel, Stainless Steel, Aluminium. Heat &changers, Condensers a Chillers. 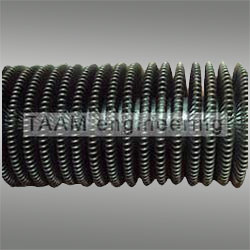 S/T : Is an integral extended surface tube having helical fins (19, 26, and 40 on the outside & designed primarily for shell & Tube heat Exchanger application, to increase efficiency and reduce cose. 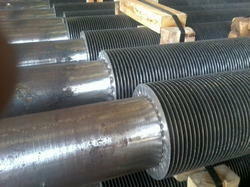 We are engaged in providing a wide range of Spiral Wound Finned Tubes to our clients. We have been designing, manufacturing and selling helically finned tubes since 1985 with global success and are one of the world’s leading companies in this area.